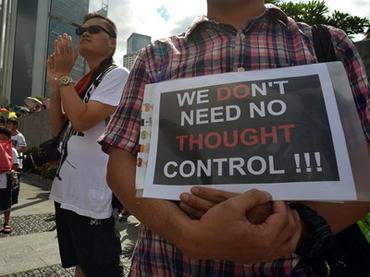 On Saturday, September 1, 2012, tens of thousands of people took to the streets of Hong Kong to protest against what many believe to be an attempt by the authorities to ‘brainwash‘ students. It was the second mass demonstration in only two months, after an estimated 82,000 pro-democracy demonstrators marched through the streets of Hong Kong for the annual rally for human rights. (Read BBC news article here). During the latest demonstration, protesters demanded that the authorities cancel proposals to extend the national curriculum to include ‘Chinese patriotism lessons’, which aim to foster Chinese identity. The government plan to introduce the lessons, which many believe will be biased towards Beijing’s ruling Communist Party, in September, 2013. In a poll conducted by an association of men’s and women’s clubs, 74 percent of students and 77 percent of parents opposed the introduction of the classes into schools. “We want our kids to know more about China, but such curriculums may teach them to confuse a country with its ruling party,” said Eva Chan, of Parents’ Concern Group on National Education. An education ministry spokesman said the government would continue to listen to all views but made no hint that it would drop the lessons. 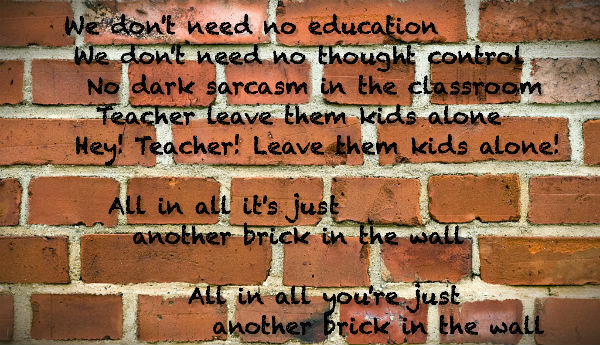 During Saturday’s demonstration, one young protester carried a placard that read, “We don’t need know thought control”, a reference to a line in the well known Pink Floyd protest song, “Another Brick In The Wall”, (see video and lyrics below) about schools’ and governments’ indoctrination of children. The hit record, sold over 4 million copies worldwide. demonstration – a public meeting or march protesting against something or expressing views on a political issue. patriotism – devotion to one’s country. curriculum – the subjects comprising a course of study in a school or college. See image below for lyrics. What do you think? Are the people of Hong Kong right to be concerned and demonstrate over the government proposals for Chinese Patriotism Lessons or should they believe the words of Carrie Lam, the city’s chief secretary of administration, when she says that the government isn’t in a rush to start national education, and labelling it as brainwashing would be wrong? Please tell us what you think in the comments box below. I’m not against letting the kids know more about China and I believe that the people of Hong Kong have the right to be concerned and demonstrate over the government proposals for Chinese Patriotism Lessons. I hope this issue will be resolved in the right way.